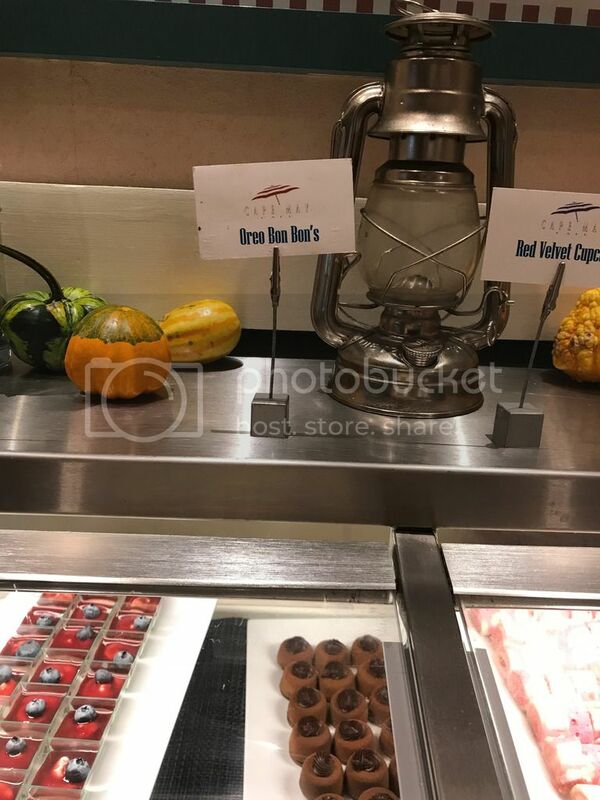 Discussion in 'Disney Restaurants' started by marmar, Nov 3, 2018.
does anyone know if there are still crab legs on the buffet at Cape May? I had heard that they were not available every night. It’s the main reason we go there. Had them on Monday 10/22. They also had the largest peel and eat shrimp we have ever seen offered at a buffet. Will definitely return. The waitress told us that they had finally switched up the desserts also. They were very tasty. We went on a Friday. They had Crab Legs but we were not fans. They did have them though. We too are not fond of the crab legs at Cape May. In fact we were very disappointed with the food at Cape May. We loved the buffet at Cape May. We ate there on Oct 11th. They had two different kinds of crab legs and very big peel and eat shrimp. It was all very good. I do low carb and there was plenty to eat. We paid $52 per person and feel it was well worth it. Especially after the dismal meal at BOG for $65 and mediocre food and service. I really enjoy the crab legs at Cape May Cafe. Yes, they had them when we went the first week in October this year. They used to have crab legs on a rotational basis, but now they are there every night. Crab legs are every night. And the Oreo Bon Bons are back too. That rumor seems to make its rounds, but they've always been there any night we are there, which is usually twice each trip!! Enjoy!! galaxygirl76 and Hopefully like this. Cape May is has been known for mostly seafood and especially crab legs. They've always had crab legs when we've gone. Non Seafood lovers will not like Cape May. WHAT THE OREO BON BON ARE BACK!!! The real ones not that crappy "bar" they tried to pass off?? I disagree. I have always loved Cape May. I find plenty to eat and leave full and satisfied. porschegrl and North of Mouse like this. Not just mostly. It IS a seafood buffet. Yes, that's what it's called and does have lots of seafood and related dishes, but it also has enough non seafood dishes to please any non seafood eater, ie. roast beef - carved to order, ribs, braised chicken legs, sausage dish, several pasta and veggie dishes, plus others, and great salads/breads/soup/desserts. No one will leave hungry. galaxygirl76, Hopefully and porschegrl like this. I am not a seafood fan but went with others who were. I found the non-seafood selection while decent tasty food was short on selection. There are far better buffets for those who won't eat the seafood. I respect that you did not enjoy Cape May Buffet. galaxygirl76 and North of Mouse like this. Yaaaaaaay, for the real bon-bons!!!!!!!! I asked for them 'every' trip I was there!!!!! Maybe, enough others did also. Now, if they'd only bring back my other favorite there - the large pan flan. Those little tiny 'teasers' just don't 'get' it and I usually tell them - doesn't even taste the same.